The Apple iPad. A technology company executive pleaded guilty to providing confidential information on Apple and other companies, as part of a massive insider-trading probe. A technology company executive pleaded guilty to providing confidential information on Apple and other companies, as part of a massive insider-trading probe. Walter Shimoon, 39, pleaded guilty in Manhattan federal court to conspiracy and securities fraud charges arising from schemes in which he gave confidential information to workers and clients of an expert networking firm. The San Diego, California man, who entered his plea before US District Judge Jed Rakoff, "also provided inside information to a consultant who operated a research firm and then provided the information to certain money managers," a Justice Department statement said. 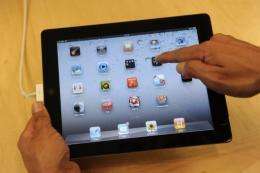 He was arrested in December and accused of leaking secrets about Apple's iPad before it was formally launched, as well as providing fresh information about the iPhone 4, another Apple product. As business development chief at Flextronics International, Shimoon secured confidential information about the firm, suppliers like OmniVision Technologies Inc. and Apple. Shimoon then shared the secrets with employees and clients of the firm and to Primary Global Research, a consulting firm that paid him about $27,500 for his work. According to the original charge sheet, Shimoon provided confidential information in October 2009 on two companies, including "sales forecasts information and new product features for Apple's forthcoming iPhone cellular phone." Shimoon faces up to 30 years behind bars after pleading guilty to two counts of conspiracy to commit securities fraud and wire fraud, and one count of securities fraud. His sentencing was set for July 8, 2013.